You can tell that the end of the summer is at hand when the Japanese sweets change over to autumnal vegetables and fruit. The moment I'm waiting for is for marron (chestnut) to start showing up everywhere. Though they aren't quite at the critical mass stage, sweet potato is making a strong showing already. 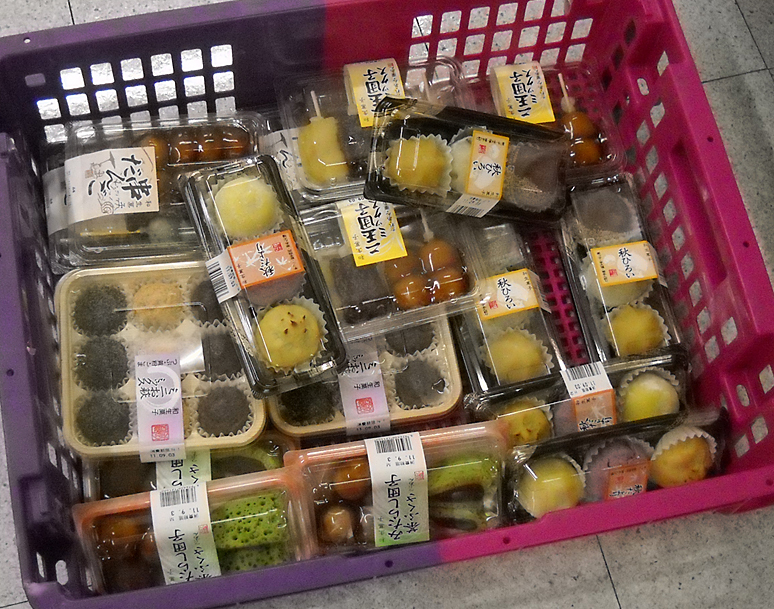 This basket was on the floor of Seiyu supermarket in preparation for adding them to the shelves. At the top center are three types of sweet potato manju. I would have bought them, but I didn't feel right snapping them out of the basket. It wouldn't feel exactly like "stealing", but it seemed like improper snacking protocol. there is a snacking protocol? i need to be educated of my neanderthal ways.